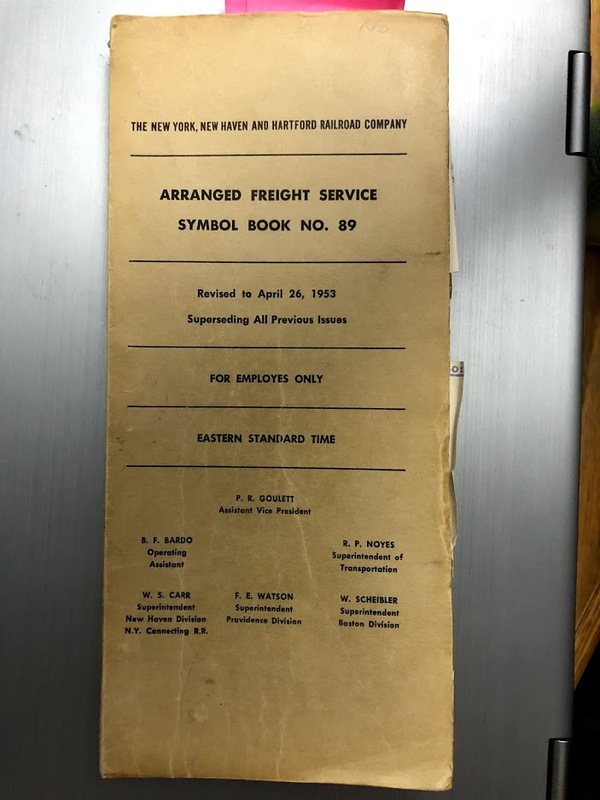 So the employee freight schedules on the New Haven, Arranged Freight Service Symbol Book, were published at the same time as the Freight Train and Package Car Schedules. New Haven fans often refer to these as Symbol Books. They also carried the same numbering scheme, until the McGinnis era. 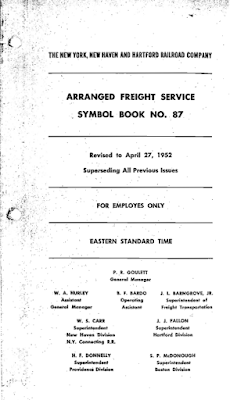 Like the employee timetables, the Arranged Freight Service was restarted at #1 during that era. Probably to coincide with the current employee timetable. However, the Freight Train and Package Car Schedules retained the original numbering scheme. 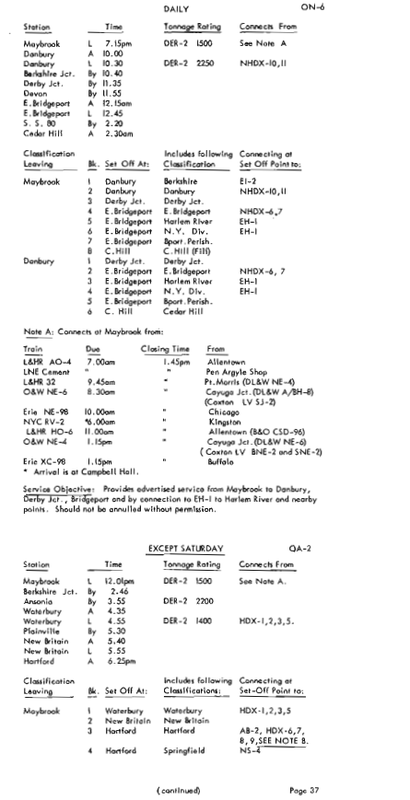 The early editions appear much like the later Freight Train and Package Car Schedules. The presentation of information is almost identical. The latest edition I have with this format is a NHRHTA reprint of the October 30, 1929 issue. If this format was combined with the 1935 Package Car Schedule I mentioned in the last post, it would comprise probably 90% of what became the public freight schedules. The cover of the June 12, 1927 issue does indicate "For Employes Only." An interesting sidebar - in pretty much all of the New Haven official publications employee is spelled with only one 'e' ("employe"). The story that I've heard is that the second 'e' is optional, and the railroad chose to save on printing costs and eliminated it. A similar reason has been attributed to GE as well, which is listed on this site, as is an interesting alternate origination: since the 'e' and 'r' keys are next to each other on the keyboard, eliminating the extra 'e' reduced the risk of accidentally typing 'employer' instead of 'employee' in legal documents. The earliest issue I have in the format I'll address today is April 27, 1941 (No. 71), the scans are from No. 87 (April 27, 1952), while I've provided some written examples from No. 89 as well. *Cars consigned to Cremo Brewery, New Britain, classified as Cedar Hill from all points except Springfield and Cedar Hill. From Cedar Hill classified as Berlin block. This note is necessary because while Cremo Brewery is in the city of New Britain, its siding is off of the Springfield mainline. It's serviced by whatever train is assigned to work Berlin, not New Britain. New Britain (from Springfield only). So this clearly tells us that (as would be expected) cars bound for New Britain from Springfield don't go all the way to Cedar Hill before heading to New Britain. They'll be put on a train from Hartford instead. Which makes sense. But this classification changed from time to time. For example, by April 25, 1965, there were no trains scheduled from Hartford that would go through New Britain. So all cars destined for New Britain were classified Cedar Hill. No. 89 has simplified classifications for the P.R.R. compared to earlier issues. For example, No. 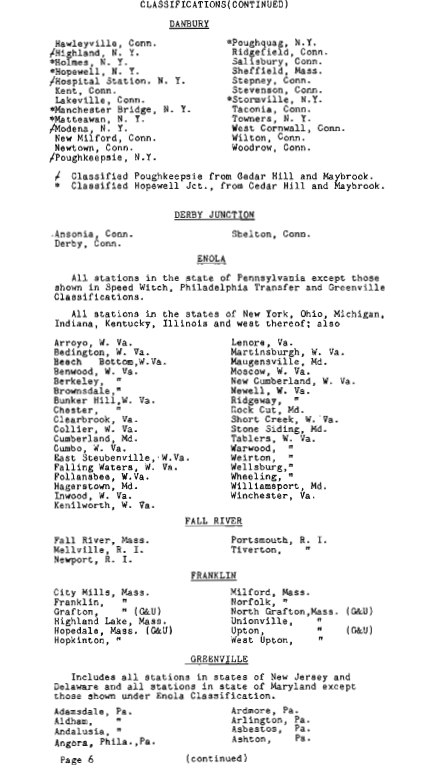 86 from September 30, 1951 has extensive classifications for Enola and Greenville. No. 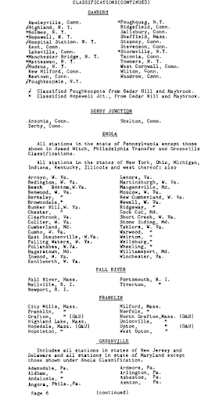 71 from April 27, 1941 has six different Pennsy classifications. At the end of this section is an alphabetical list of stations that indicates their classification. Then it lists all the stations (towns) it serves, including times. Next to each station is indicates any connections they make (by symbol, including connecting roads), or 'extra' for a local freights in later issues. It also includes the usual power and tonnage rating. After that it lists the blocks from each town, and any classifications within those blocks. It also notes the connections for those specific blocks. 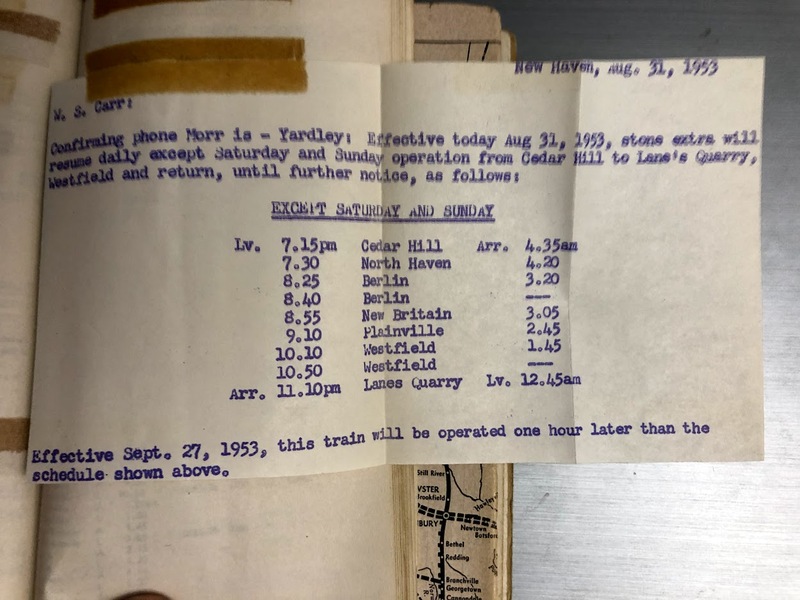 Special notes follow, such as closing times at freight houses, and then the service objective is listed. This gives you all of the information needed to block inbound and outbound freights, assigned power (if not specific road numbers), and timing. Note that in this section, these are all through freights, with a few exceptions. Since No. 87 doesn't have a New Hartford Local, here's the Valley Local instead. This section details the local freights. The local freight symbols changed over the years as divisions were combined. For example, through at least No. 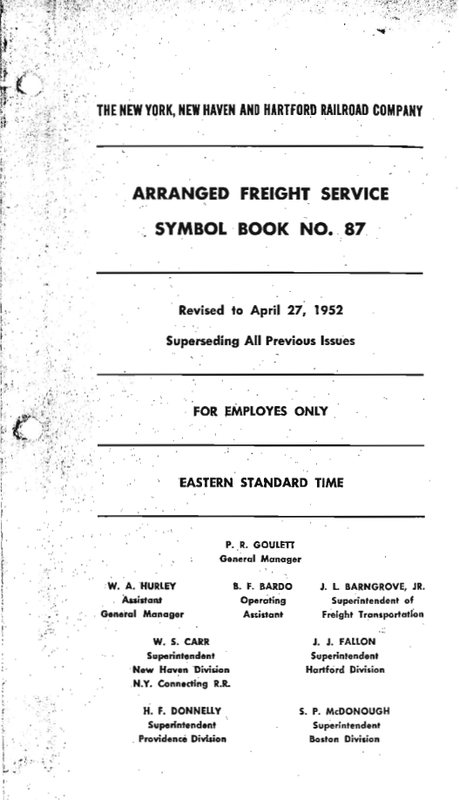 87 (April 27, 1952), the actual locals were noted in the connections with the symbol freights. New Haven locals were NHDX-x, Providence PDX-x, Hartford HDX-x, etc. but by No. 89 in 1953 they are noted as 'extras' in section 2, and in the local freights identified with a two-digit symbol, NX-x, PX-x, BX-x. In 1941 there were four divisions, New Haven, Hartford, Providence and Boston. In 1953 the Hartford Division has been eliminated, and in later years there was only two, New Haven and Boston Divisions. The local freights include the towns they serve, the days they serve them, and times. Some trains have specific notes as well. NX-8: Connects at Beacon from NYC-TV-1, due 6:30am with autos from Tarrytown and NYC-VB-2, due 10:45am with cement from Hudson. It's scheduled to be in Beacon from 10:25 to 11:30 to receive these cars. NX-9: Switches yard until 2:00pm. Places Poughkeepsie meat by 6:45am. After placing the meat, it's scheduled to leave Poughkeepsie at 7:00am, work Highland from 9:15 to 10:15 , then be back in Poughkeepsie (abbreviated 'Poke' later in the book), at 10:30 to work the yard until 2:00pm. So if you're modeling Poke, you know NX-9 is delivering the meat reefers first thing, then going to work Highland, and returning to work the yard until 2:00pm. Fantastic information. Float Schedules. Pretty self explanatory, although interesting nonetheless. They have the Diversion of Perishables information listed here. Some also include truck service and the towns they serve. 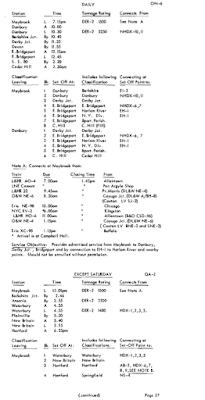 The 1953 through 1964 ones also include L.C.L service, which incorporates the truck schedules. This appears to be the same as the public schedules, with a little more information, such as zones. I haven't quite figured out the zone system, but the key info here remains the same as the public schedules - what cars need to be spotted at the freight house? My Copy of No. 89 revised to April 26, 1953. This is a very interesting issue, that I grabbed on eBay not realizing that it was any different from any others I had located. 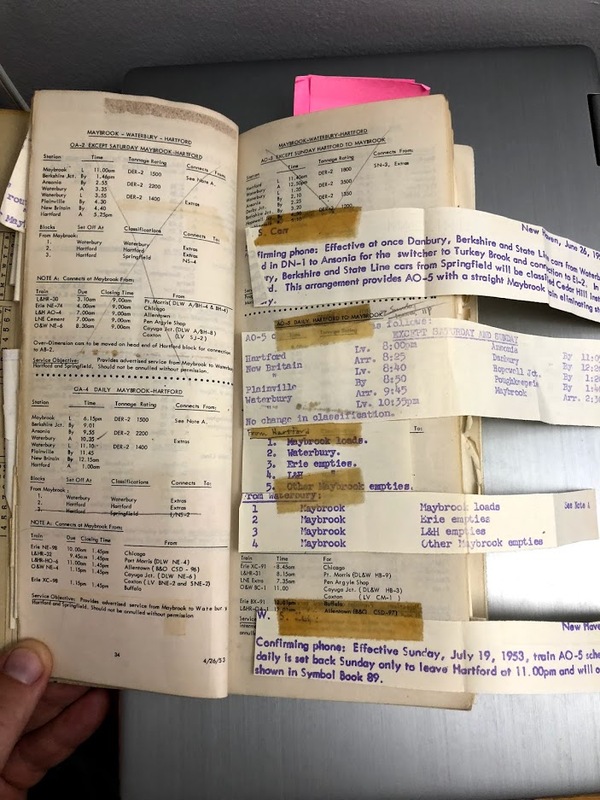 Whoever owned this one taped all of the bulletins that modified service into his copy. So it is loaded with these modifications, additions, and cancellations of specific trains. In addition to those notes, there are a lot of updates and notes made in pencil as well. He's taped in the map/schedule for the New Canaan Branch. I don't know if he wanted the map or the train schedules. It also has the map page from a B&M public timetable, so I'm guessing the maps. Aside from showing how complex operating the railroad was in this era, with regular changes and updates, I'm surprised that he appears to have included all of them, rather than just the ones that applied to a specific line as one might expect, since conductors often worked regular jobs. 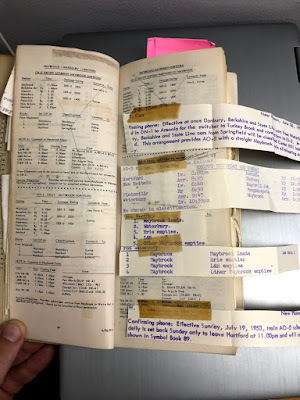 If the maps weren't taped into the back, I might think that it was an office copy, with the changes taped in place for the purpose of typing up the revisions for No. 90. Whatever it's origin/purpose, it's the only one I have that mentions a "Stone Extra" for servicing Lane's Quarry in Westfield. I hadn't looked at it in a while and had forgotten that it's not for Cooke's Quarry, although it does go through New Britain and Plainville.e. I suspect that "Stone Extras" created to local quarries when the New Haven was (re) ballasting a line. So those two documents, the public and the employee freight schedules, are where to find the key information for freight schedules and more. They are both pretty useful, although the Arranged Freight Train Service Symbol Books have more information that might be helpful to modeling operations. The Freight Train and Package Car Schedules are easier to find, though.